Tuesday June 23 1908 I had churning and other work this morning. After early dinner went down to spend the afternoon with Mother. She and Emma one doing fine. stopped at Woolfs Will about the same. Did evening work. was very tired. This is Dorothy [Saltz?] wedding day to Clifford [Crosby?]. 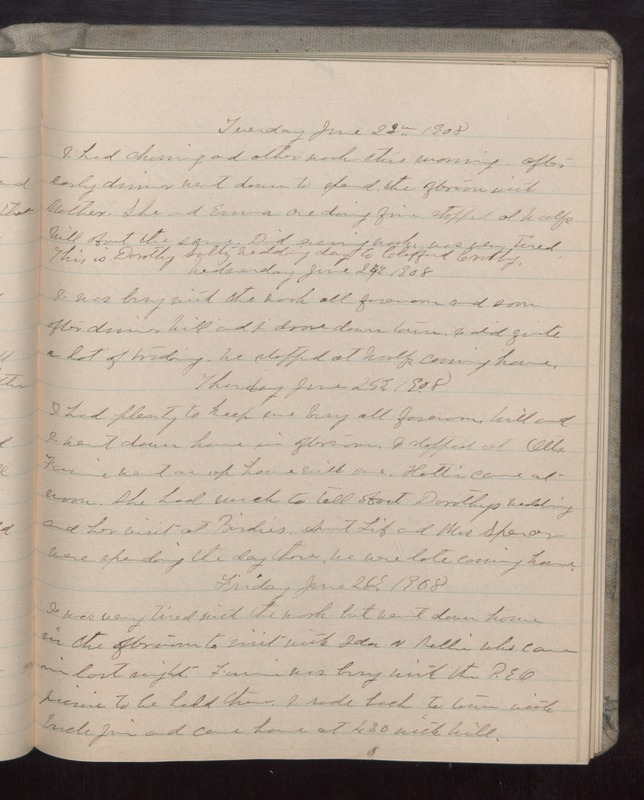 Wednesday June 24 1908 I was busy with the work all forenoon and some after dinner Will and I drove down town. I did quite a lot of trading. We stopped at Woolfs coming home. Thursday June 25 1908 I had plenty to keep me busy all forenoon. Will and I went down home in afternoon. I stopped at Otts Fannie went on up home with me. Hattie came at noon. She had much to tell about Dorothys wedding and her visit at Birdies. Aunt Lib and Mrs Spencer were spending the day there. We were late coming home. Friday June 26 1908 I was very tired with the work but went down home in the afternoon to visit with Ida & Nellie who came in last night. Fannie was busy with the P.E.O. picnic to be held there. I rode back to town with Uncle Jim and came home at 4.30 with Will.